This week, the field of science bloggers are addressing the question "Are we doomed?" It's a good question. There is no shortage of evidence that we are, in fact, doomed. But as an incorrigible optimist, my response is a cautious "maybe not?" The numbers on the right-hand side are probabilities of being less than some number. For example, there is an estimated 14.4% chance that the population will be less than 6 billion in 2100, and an 89.4% chance it will be less than 12 billion. 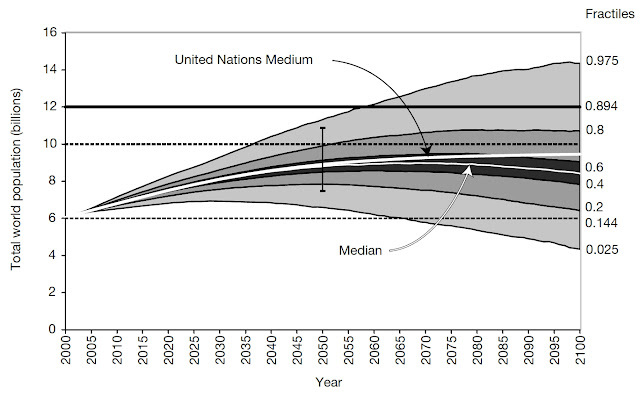 The thick white line is a UN prediction, not part of this study, provided for the sake of comparison. This turnaround is remarkable, since the human population has been growing exponentially, with few declines, since the beginnings of recorded history. So what's behind this unprecedented reversal? It turns out that Malthus didn't know everything about human nature. Population scientists have noticed a surprising, yet robust, pattern in human societies, which they call the "demographic transition". This transition occurs in stages, which are linked to economic and social development. In pre-industrial societies, parents have many children, since the survival of each individual child is uncertain. As improvements are made to food supply, hygiene, health care, and infrastructure, more children survive. This leads to a period of rapid population growth. As the society becomes increasingly urbanized, children become less of an asset (for helping with farmwork) and more of an expense (they must be educated in order to participate in the economy). Increasing education also gives women options other than motherhood. Access to and acceptance of contraception increases. As a net result, birth rates fall. Eventually, birth rates decrease to levels comparable to or even less than the death rate. The population level then stabilizes or even contracts. Lines indicate number of births (blue) and deaths (red) per 1000 people per year. Note that the death rate in Sweden now exceeds the birth rate. This is also true of most European nations, as well as Canada, Russia, Iran, Japan, China, and many other countries. The United States is an exception for now—but the New England states are an exception to the exception! Many more developing countries have declining birth rates, so that their populations are predicted to stabilize within decades. The idea of the demographic transition, and its robustness across human societies, gives me hope. Not only because it predicts the end of population growth, but also because it suggests a new paradigm of human existence. A paradigm where quality of life is valued over quantity of life. A paradigm where each individual is cared for, educated, and allowed to dictate the course of his or her own life. A paradigm where the population is stabilized not by coercion, disease, wars or famine (as Malthus predicted) but by the free choices of happy and healthy people. Of course, there are still major obstacles to overcome before we can live sustainably on this planet. Even as our population stabilizes, irreparable damage to our environment continues. Global consensus remains elusive on challenges such as climate change, deforestation, and biodiversity loss. And conflict, inequality, and oppression squander much of our global human potential. We must facilitate and manage the demographic transition across human societies, in an environmentally sustainable way. If we achieve this goal, we will be on our way toward a healthy and happy, indefinitely sustainable human population. So maybe, just maybe, we are not, in fact, doomed. If only it was as peachy as the UN would like us to believe... Yes, technically we are supposed to stop growing very soon, and in fact many countries have gone through this demographic transition already and you are seeing what some demographers are calling a new phase of the transition - old society. Japan, Germany, Switzerland, China ... the United States of you exclude the Latin American population, have all gone through this and are now in the last stage. But there are still two main points of concern. 1. Economic 'growth' must be reined in, otherwise the countries like China and India who want an American/European lifestyle will use up so many resources that there will be little left over. There is an AWESOME but long article in Utne about Slow Growth Economics that really makes me hopeful along the lines that you are in this post. It is really worth the read I promise! 2. A perhaps more alarming side to this is that projections are based on assumptions, and the UN is politically pressured to make certain assumptions that are more comfortable than others. One of the largest assumption being made here is that women in less developed countries currently are and will continue to have less babies then they did previously, eventually getting down to replacement level or below. The problem here is that nobody really knows if that is happening, and in fact there is a lot of research that shows the opposite. There is a strong assumption that as people move from rural to urban areas, they will have fewer babies. The assumption is so strong that few people are studying this, and the few that do are publishing findings that question or outright disprove this assumption. Furthermore, few people are studying fertility in rural areas of less developed countries - getting date is just really difficult. So in short, we don't know whats happening out there, and the little we do know does not necessarily support that fertility is declining. Yet the UN's projections put a lot of faith into the hope that in the next 25 to 50 years, fertility in countries with very high fertility today will get reduced to around 2 or less. In wealthy countries the average fertility rates have dropped to below replacement levels. The problem is that the average hides quite a wide variance. A lot of people have no kids, while a minority have very large families. Now, suppose that the predisposition to have large families in a wealthy environment is inherited - either genetically or culturally. For example, people for whom a high-flying career and the social status that goes with it are unimportant. Well, as each generation goes on, there will be more and more people predisposed to have more and more kids. In other words, a think the 'demographic transition' is just a hiatus. Exponential population growth will eventually be resumed. @Marta---Thanks so much for your (much more informed) perspective! You're of course right that not every country can do the transition the way the West did, or the way China and India want to. That "slow growth" article looks awesome, and I will definitely give it a close reading. Your second point is well taken. In reading about the transition model, there seems to be an implicit assumption that as societies urbanize, they will start to adopt liberal ideas about contraception and women's equality. This assumption seems a bit Western-biased, and it will be interesting to see whether anything like that happens in African and South American countries. In all cases, it seems that universal education is a key factor in promoting demographic transition. @Tom- Your argument hinges on the extent to which tendencies to have large families are inherited. Clearly they are in some cases; for example, Mormons have lots of children, who are then raised as Mormon and encouraged to have many children of their own. But on the other hand, Irish and Italian families have traditionally been large, but now these countries are going through the demographic transition along with the rest of Europe. So we'll have to see how robust this inheritance tendency is, when it competes against changing cultural influeneces.